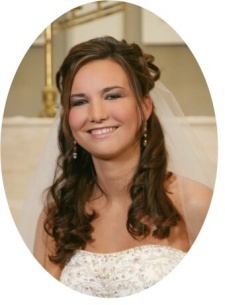 Nicole Christian Misselhorn (January 22, 2009) | Burmeister-Johannsen Funeral Home, Inc.
Nicole Christian Misselhorn, the daughter of Hans Jay and Susan (Hawley) Nielsen, was born on September 14, 1983, in Manning, Iowa. She was baptized at Immanuel Lutheran Church in Harlan, Iowa, on October 30, 1983. Nicole grew up on the family farm south of Defiance, Iowa, where she attended Irwin-Kirkman-Manilla schools and was active in 4-H, LYO basketball, and cheerleading. After graduating from IKM High School in 2002, Nicole attended Iowa State University for two years. She later attended Des Moines Area Community College (DMACC) in Carroll, Iowa, where she received her RN degree on May 7, 2007. She was proud to have passed her nursing boards on August 19, 2008. On June 16, 2007, Nicole married Jeremy Keith Misselhorn at Immanuel Lutheran Church in Harlan. They made their home in Manilla, and she was employed at the Manilla Manor. Nicole was a member of Immanuel Lutheran Church in Harlan, where she was confirmed on May 3, 1998. She was an active person who loved swimming, spending time around horses, and watching stormy weather. Nicole enjoyed country music and fashionable clothes, and appreciated nice cars and Harley Davidson motorcycles. Her dog, Taco, was very special to her, and she cherished her family and many friends, to whom she was a true blessing. Nicole C. Misselhorn died on Thursday, January 22, 2009, at Nebraska Methodist Hospital in Omaha, Nebraska, at the age of 25 years, 4 months, and 8 days. Nicole is survived by her husband, Jeremy Misselhorn of Manilla, Iowa; her parents, H. Jay & Susan Nielsen of Defiance, Iowa; one brother, Matthew Nielsen of Guam; one sister, Carly Nielsen of Defiance, Iowa; her paternal grandparents, Hans and Joyce Nielsen of Harlan, Iowa; her maternal grandparents, Robert and Norma Hawley of Denison, Iowa; other relatives; and many friends. Memorial services were held on Wednesday, January 28, 2009, at Immanuel Lutheran Church in Harlan, Iowa, with Pastor Steve Chellew officiating. Jennifer Perkins served as the organist. Burial of ashes will take place at a later date at the Nishnabotna Township Cemetery in Manilla, Iowa. The Burmeister-Johannsen Funeral Home in Harlan was in charge of the arrangements. Condolences may be left online at www.burmeisterjohannsen.com. Dear Sue, Jay, Jeremy, Matt, Carly, Norma, Bob, Beth & all of the Liechties, Robert, and Jane & her boys: Nicole was such an angel and now she truly is one in heaven. I can’t imagine how much you will miss her! She’s an inspiration to all of us as to how to live life to the fullest and get the most from each day. May God grant all of you His peace. My deepest sympathy to Nicole’s family and husband. I knew Nicole only a short time as her nursing instructor but I was amazed at her kindness and caring attitude. She always had a smile for everyone she met. My thoughts and prayers are with you at this time of your great loss. Words cannot express what I felt when I heard of Nicole’s passing. Our prayers are with you all at this time, as they have been throughout. With love and sympathy. We were saddened to learn of your tremendous loss. We know this is a painful time for you;but rest assured there are many who share your burden at this time. May God grant you strength,peace, and comfort. I am deeply sadden by your loss. I never knew a day that Nicole didn’t have a smile on her face. She will be missed very much. My thoughts and prayers are with you. I am deeply sorry for your family’s loss. I’ll continue to remember Nicole in my heart and my thoughts. Please know you are all in my thoughts too. I was so saddened to hear of Nicole’s passing. She was a beautiful and caring person, and I had always hoped she would beat this thing and be able to practice as the compassionate nurse I know she would have been. Her strength and determination are an inspiration. God grant you comfort and peace in these difficult times. Please know our warm thoughts and prayers are with you during this painful time. We are so sorry for your loss. Im sorry for your loss. She fought the battle long and hard. She is at peace now with the love of Christ. She will be forever missed.